Brad Newsome (left) goes over a play with Legacy Christian basketball player Keano Hammerstrom during the 2019 season. Newsome, who was named Metro Buckeye Conference Coach of the Year, was fired as the team’s coach on April 9. XENIA — Barely two months after coaching Legacy Christian Academy’s boys basketball team to its best record in school history and first conference title, Brad Newsome was informed that the school would be going in a new direction without him next season. 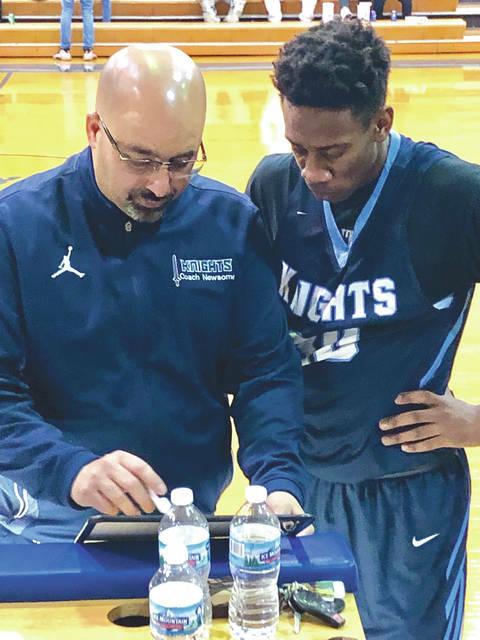 Newsome, the Metro Buckeye Conference’s Coach of the Year and District 15’s 2019 Division IV Coach of the Year, said Legacy Athletic Director Bev Moser had informed him that he’d been fired on April 9. “I went in for my end of the season review and she told me that they were going in a different direction next year,” Newsome said by text on Tuesday night. Newsome had previously coached at Yellow Springs High School, but took over the then-Xenia Christian program in 2015. Unofficially, Newsome had a 60-56 overall record at LCA with a 36-28 record within the MBC. Newsome-led Knights teams recorded three straight winning records from 2017 to the present and had a record of 51-22 during that span. He has been recognized as a District 15 Division IV Coach of the Year for the past three seasons. The 2018-‘19 team finished with a 20-4 overall record — setting a new school record for boys basketball wins in a season — and won the Metro Buckeye Conference title for the first time in school history. At one point during the season, the Newsome’s Knights went on a school-record 16-game winning streak. For the season, Legacy outscored its opponents by an average of 19.9 points per game. Despite his surprise removal from coaching, Newsome remained upbeat. Phone messages and email appeals requesting comment from Moser and Assistant Athletic Director Rebecca McCaskey were not returned. https://www.fairborndailyherald.com/wp-content/uploads/sites/50/2019/04/web1_NewsomeHammerstrom_PS.jpgBrad Newsome (left) goes over a play with Legacy Christian basketball player Keano Hammerstrom during the 2019 season. Newsome, who was named Metro Buckeye Conference Coach of the Year, was fired as the team’s coach on April 9. Submitted photo.